This week several questions in Parliament were about the drop in the price of dairy products and the effect on the New Zealand economy. But the price of wool, beef, timber and logs are not dropping. I began wondering about commodity prices. On the radio I heard a journalist say that if oil prices are down then economic growth rises. He went on to say how well the economy will do now that the price of oil is falling. That is a deceptive argument. As Automatic Earth blogger Raul Ilargi Meijer pointed out the oil companies are already mired in debt, and when they receive less for their oil their finances will be in real trouble. He says, “there is no industry like the oil industry and it’s highly doubtful there’s another one with such debt levels”. The drop in crude prices has undercut the profitability of many oil projects and if you are an oil-exporting country you are vulnerable. Russia is being hammered right now and the ruble is in freefall. The share market in Saudia Arabia is falling. Meijer points out that plummeting oil prices don’t just mirror the state of the real economy they will drag the whole economy down. The oil industry swims in debt not reserves. Remember in 2012 Petrobras pulled out of New Zealand? They said they hadn’t found enough oil. Rather than giving the credit to Greenpeace for their vigorous opposition to deep sea drilling, the company’s explanation about low profitability is probably nearer the truth. Petrobras is the world’s third biggest oil company with sales of $150 billion a year. The Telegraph writer Ambrose Evans-Pritchard in an article on oil company indebtedness wrote “Petrobras is committed to spending $102bn on development by 2018. It already has $112bn of debt. Petrobras’s share price has fallen by two-thirds since 2010. He says “China’s economic boom since 2009 is actually a debt-driven bubble, and that its unsustainable, resource-intensive growth has temporarily boosted the prices of commodities.” He has been expecting the bubble to burst for a while now. China's consumption of commodities drove real money into a new "asset class". But production has spiked and the bubble is popping now as real money leaves. We are now at the end of the commodities supercycle. “Like all bubbles, from the Roaring Twenties bubble to the Dot-com bubble, the 2000s commodities bubble started as a legitimate economic trend and devolved into a “hot money”-fueled speculative mania. “Record-high commodities prices led to ambitious plans such as Quebec, Canada’s $80 billion investment and decision to open its vast northern region to mining development – an area twice the size of France with an abundance of iron, nickel and copper ore deposits. “High oil prices have incentivized the development of a wide range of technologies that are helping the discovery and production of far more oil than originally estimated and helping to allay Peak Oil fears for the time being. Fracking in US made US the biggest oil producer in the world. “China and India’s real estate development and infrastructure construction soared in the early 2000s, causing economic growth and the demand for raw materials to hit a powerful upward inflection point. “While the Chinese government builds scores of excessively extravagant government buildings, entire uninhabited “ghost cities” are cropping up, as can be seen in satellite images. “When China and India’s economic bubbles pop, the commodities bubble is sure to crash along with them. We have also seen the rise of commodities as an investment class. The boom has taken place across a wide range of commodities, and, indeed, is unprecedented in scope and size. These commodities include sugar, cotton, soybean oil, soybeans, nickel, lead, copper, zinc, tin, wheat, heating oil. “The unprecedented aspects of the commodities boom and bubble are due to a relatively recent fundamental change in the commodities market – financialization, or the large-scale transformation of the commodities market into an investment asset class like stocks and bonds. “Pension funds have become one of the largest sources of capital parked in long-term commodity investments ever since Congress essentially forced them to diversify into commodities by law. The tsunami of new investment capital flowing into the commodities market has been a major contributor to the boom in prices. In addition, the financialization of commodities paralleled the financialization of, and bubbles in, the US housing and mortgage markets. But it is not just the commodities themselves. There is now a staggering range of commodities derivatives products. They call it “financial innovation”. 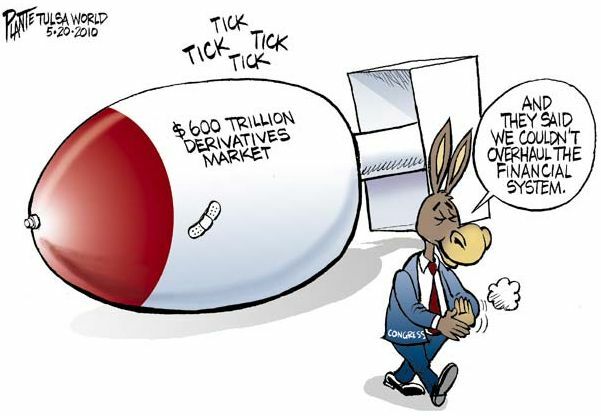 Here is Jesse Colombo again in 2011 “The market value of agriculture commodities derivatives grew from three quarters of a trillion in 2002 to more than $7.5 trillion in 2007, while the percentage of speculators among agriculture commodities traders grew from 15 to 60 percent. The total number of commodities derivatives traded globally increased more than five-fold between2002 and 2008. The commodities market has become increasingly dominated by big banks, hedge funds and other speculative participants. According to Wikileaks cables, speculators, not supply and demand, were the main cause of the 2008 oil bubble when oil hit $147/barrel. And here is an article from earlier this year. The author is one Harry Dent and the website http://economyandmarkets.com/markets/foreign-markets/2014-the-year-china-bubble-burst/ and I quote it in full. “For two years now, I’ve been warning in our Boom & Bust newsletter that China is going to be the ultimate and largest trigger for the next global financial crisis… a crisis that will be deeper and last longer than the first one that governments quickly combatted with unprecedented quantitative easing and bailouts. And the cracks in the greatest bubble in modern history are finally starting to show. China bubble burst? Yes. And 2014 is the year that happens. When it does, it will trigger a market crash around the world. George Soros warned late last year that China’s subprime lending was starting to look like the U.S. just before its crisis. Now Leland Miller, President of China Beige Book International, is warning that 2014 will be the year of defaults for China. Defaults will occur in trust products… wealth-management products… corporate bonds… and even some government bonds. China’s subprime lending has mushroomed to more than $2 trillion in the last five years. Its corporate bond market now totals $4.2 trillion. Its total credit has surged from $9 trillion to $23 trillion since late 2008, or 250% of GDP. Just like it was, right before our subprime crisis, right now every dollar of debt China incurs adds only 15 cents to its GDP. At the height of our crisis in 2009, each additional dollar of debt created 85 cents of GDP. China is currently getting very little bang for its borrowed buck. As I always say: Debt is like a drug. It takes more and more to create less and less effect until the system fails. Now, China’s system is starting to fail… and the bubble is starting to blow up and the fallout will affect us all. As Miller warns, this is a different China than that of the past two decades. The government understands that it has to slow growth after massively overbuilding and inflating bubbles. This, he warns, will impact China’s neighbors — places like South Korea, Japan, and Australia (where I recently issued strong warnings about the China burst) — more than most people assume. Already, an agricultural financial co-op has closed its doors, and depositors couldn’t withdraw their money. And a China Credit Trust wealth-management product of $496 million blew up. The Chinese government bailed them out.